If you love repurposing here’s a fun way to take a tall bookcase, paint it with a faux finish, turn it on its side, drill some holes and add shelves. 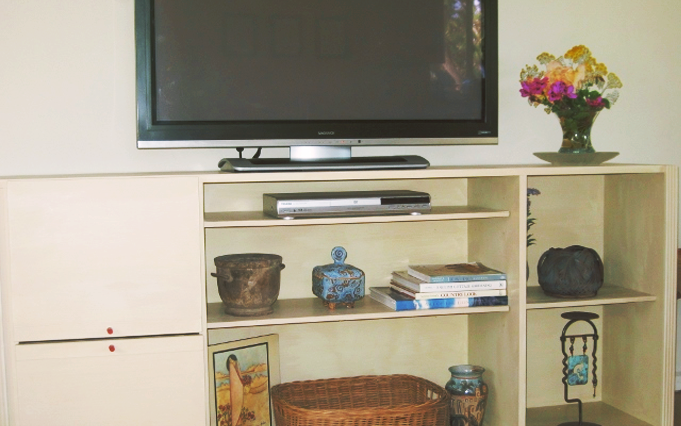 You’ve gone from vertical to horizontal and created a hip, organized Media Center for your flat screen TV. I’ve used a Mid-Century Modern bookcase here. The faux finish is created by using two shades of sandy beige water-based semi-gloss paint. I already did the faux finish on this bookcase last year when I was still using it upright. So, I’ll focus on how to paint and install the new shelves in this post. Organizing Tip: always label your paint cans with date and project so you can do touch-ups later. Start with a tall bookcase with some removable shelves. Remove the shelves. You may be able to reuse them, however probably not; thus the plywood listed below. Drill and drill bits to create the new holes for shelf supports. If you have an attachment for drilling out a large hole for the DVD Player’s cord that’s great. If not; you can wing it with large drill bit. ☐ Measure the space left-to-right and cut as many shelves as you like. We chose three total and decided to inset them a bit from the outward (front) edge of the unit. ☐ Sand the rough edges; then prime each shelf. I use water-based primer and paint. Behr is always a good bet. 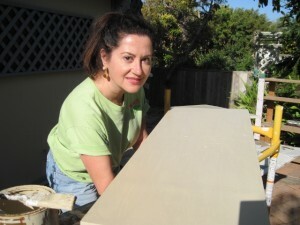 ☐ Paint each shelf with primer and let dry. Then paint with the lighter shade of paint. Let dry thoroughly. 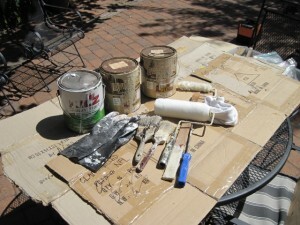 Apply the darker shade of paint using a rag in uneven, light strokes to create shading and visual interest. ☐ Measure the inside of the unit using a level and drill holes for the shelf supports. On the exterior side, mark your drill bit so you don’t go too deep and come out the other side. ☐ Drill out one hole large enough for the cords from DVD Player to enter at the upper center of the back wall. Add the shelf supports and top them with the shelves inserting them slightly on the diagonal so you don’t scratch your new paint job. (Remove leveling discs, if any, from the side that used to be the bottom). ☐ Add your favorite items to each shelf and enjoy! Organize all of your materials before you begin so you don't get frustrated later on. No one likes to make the hardware store run in the middle of a project! 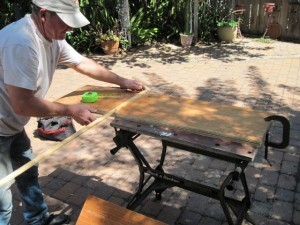 I am reluctant to use a circular saw so I called in Kevin for that. Ahhh -- first coat -- watching paint dry. Here's where I practice patience. And, don't forget to clean your brushes right away! 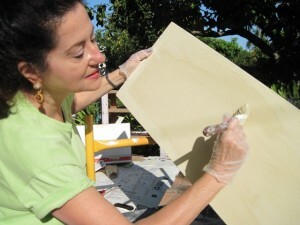 To create the faux finish, paint the lighter shade of semi-gloss first; then let dry. Next add the darker shade with a rag leaving uneven shading. AFTER: Here's another picture. 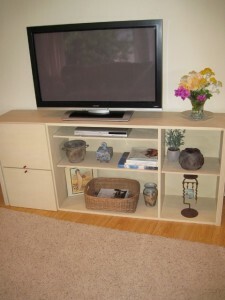 A place for everything including DVD Player, magazines, books, baskets and art. If you’ve liked this post, or have any questions please let me know and kindly take a look at our videos at Organized Beautifully on YouTube. Thank you very much.